We manufacture and offer the custom size LED light Panel/LED Light Sheet, which integrate the led strips into the light guide plate(LGP). Why we choose LED light panels as the lighting solution? (1) LED light panels are thin, high illumination with custom size. So we could tailor dimension of led light panel to fit your project. (2) Low power consumption. Even in high-output operating conditions, LED light panels consume far less power than traditional lighting fixtures during the same working hours. (3) Long service life. LED light panels do not have light-emitting, heat-depositing, light-fading, etc. Under the proper current and voltage, its service life is more than 10 times that of the conventional light source. (4) High brightness and low heat. The LED light panels have a relatively low heat generation, and even in an environment where the heat requirement is relatively high, the heat sink can be installed to solve the problem. (5) Rugged and durable. The light panels are made of acrylic materials, and there is no loose part in the panel. High quality material minimize the color change. (7) Changeable. The dimmable LED light panels can use various basic colors of red, green and blue to form different combinations of different light colors to meet the light requirements of different occasions. At present, LED light panels have been used in a variety of applications and have received increasing attention. When high-quality LED light panels are used in industrial indoor lighting, they can enhance the visual space range, improve working conditions, improve energy efficiency and reduce operating costs. They are brighter and more reliable than traditional lighting while improving visibility and employee’s safety. Commercial indoor LED panel lighting not only saves money by reducing energy and maintenance costs, but also increases employee productivity. Unlike traditional fluorescent lamps, LED light panels emit a comfortable light. This advance has proven to increase employee motivation, energy and attention by creating a more attractive and comfortable workplace. In addition, the led light panel is also used to backlit advertising for the poster or graphic in order standout the newest products. It’s popular applied in the LED light box. The led light panel also is installed in the ATM machine and vending machine to backlit poster. Dimmable LED light panels allow you to adjust the lighting in any room to match its function for a specific time. For example, in the living room, you might want to watch TV in low light but have a high light output for friends to meet. Dimmable LED light panels provide the perfect atmosphere for a family dinner, while also providing enough light for the room or as a work space for the school. These LED light panels also reduce energy consumption when dimmed. 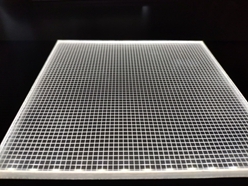 LED light panels have an incredibly thin design that makes them ideal for wall finishing applications. They are lightweight and easy to install. They have the advantages of reducing labor costs, whether they are used to retrofit offices or in new buildings. These LED light sheets are currently widely used for backliting. LED light panels are available in a variety of sizes, including the popular 2'x2' and 2'x4' styles. The size of the LED light panels now also supports customization. The LED light panels emit light evenly, do not produce spots, emit no flicker and contain no mercury. They are the best partner for modern decoration to be honest. According to the Occupational Safety and Health Administration (OSHA), evenly distributed diffused light is the ideal source of light in the workplace because it helps reduce eye strain and the negative effects of glare on employees. The low glare lens of the LED light panels also help to eliminate black spots, reducing the number of fixtures needed to cover the area. Don't you want to be trapped by a color of light? Adjustable LED light panels provide wireless control of color temperature through wall units or handheld remote controls. Studies conducted at schools have shown that adjustable lighting has an impact on test scores, productivity and learning. A milder color temperature will enable students to obtain higher scores, while a warmer color temperature reduces small movements and inattention. Accordingly, by adjusting the color temperature of the LED light panels, we can achieve environmental interventions in offices, conference rooms, schools, etc., and set corresponding lighting intensity for different tasks, such as conferences, presentations, and collaborative projects. LED light panels come in a variety of shapes and sizes which allow them to be selected and matched according to the layout of the space and the lighting effects they want to achieve. The color temperature of LED light panels includes cool white (3000 Kelvin) and bright white (6500 Kelvin). LED light panels can also be dimmed with dimmers and are compatible with motion sensors to save more energy while customizing your lighting. In order to set the color of the room and achieve the layout you want, you need to know the specifications of the panels for its output. The effect of decorating a room with LED light panels depend on brightness and lumens. Do you want to create a relaxed environment, a vivid and bright environment, or a romantic environment? Correct use of the LED light panels, such as adjustment of color temperature, beam angle, dimming ability and color rendering index (CRI) can all achieve the above effects. Lumens are the units that measure the amount of light produced by a light source. The higher the lumen index, the brighter the light source. When buying a new LED light panel, lumens are often the first factor to consider, and using this unit is more reliable than using a wattage to select a panel. The kitchen, bathroom, laundry and closet are suitable for high-lumen lighting panels, and the choice of brightness depends entirely on the appearance you want. The color temperature of the LED light panels are measured in Kelvin. Kelvin values represent different colors. For example, the light of 2000K to 3500K looks more orange or yellow and is called warm or warm white light. As the Kelvin value increases, the color becomes more "paper white", called natural or neutral white (between 3500K and 5100K), and finally becomes a blue-white, cool white (more than 5100K). As the color temperature of the light source increases, the brightness usually increases. So when buying LED light panels, we need to be aware that choosing a warm white bulb with a color temperature of about 3000K may mean sacrificing some brightness. Choosing a color temperature of about 3500k will result in higher brightness but it also means there will be higher output at the same time. In addition, we need to refer to CRI indicator when choosing LED light panels. Simply put, the closer the CRI of light is to 100 (CRI of incandescent or daylight), the better the color reproduction of the object under that light. High CRI LED light panels are ideal for living room lighting because they accurately display paint and furniture colors. High CRI LED light panels can also be used in kitchens, closets, bathrooms, changing rooms and other areas where the appearance and color reproduction requirements are high. We are always committed to providing high quality LED light panels and other LED fixtures. Our products are rigorously tested before they leave the factory to ensure you get the quality products that are genuine in the industry.